The Man Flu: Myth or Manageable? There’s a debilitating disease hits all men at one time or another, but the real question is why aren’t women or kids impacted in the same way? You might expect it to put you on the IR for weeks, but the injury report should really read that you’re day-to-day. If you’re holed up in bed indefinitely; the garbage can is never further than a 2-foot radius and daytime television is on to sooth an overzealous stomach, you’ve probably got the notorious man flu. The condition shard by all males wherein a common illness (usually a cold) is thought by the patient to be life threatening. 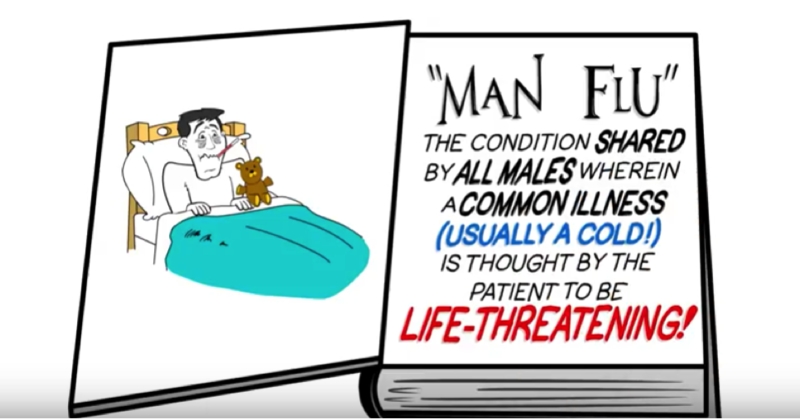 What is the Man Flu? In reality, the man flu is a bunch of symptoms including fever, cough, sore throat, runny nose, and muscle aches, often resulting from a virus brought home by your kids or even someone from your work. The man flu spreads when people sneeze or cough out droplets with viruses in them, or sometimes when someone touches a surface with the virus on it then touches their mouth or nose. The best way to fight this dreaded disease is to keep it simple – avoid close contact with people who are sick, keep your hands clean and if you happen to get the man flu don’t go to work and learn to couch or sneeze into your sleeve so you don’t spread this to anyone else. While there’s no guarantee that the annual flu shot can prevent you from getting the flu, it not only protects you but also those around you. Despite doing all these things right, you’ll still get the man flu sooner or later. If you think you have it avoid contact with other people until you’re better. That means you can stay home from work until you don’t have a fever of 38℃ or higher. Going to the doctor’s office, the walk-in clinic or emergency department for most cases of man flu is not needed and unnecessarily puts other people at risk. When you’re at home stay hydrated. Remember to use appropriate pain and anti fever medication if needed. If you’re somebody with a health condition that puts you at a higher risk, like a weakened immune system, diabetes or kidney disease you should seek medical attention more quickly. But if you’re generally healthy we recommend that you seek medical attention only if you’re having trouble breathing, you can’t keep fluids down, you have a bad cough with serious phlegm or mucus, or you can’t control your fevers despite medications. And finally, the most baffling question of all – why do women and kids not get hit as hard with this dreaded disease? Kids don’t experience the same extreme level of symptoms and as it turns out women are just tougher than you. They have the same symptoms but seem to soldier on. So take this knowledge and spread it on. Man flu will not take you down.